I had never heard of Benjamin Black until I spotted his new novel available on NetGalley, but I quickly discovered that it is a pseudonym of the Irish author better known as John Banville. Not having read anything by Banville either, I had no idea what to expect from Prague Nights, but the title was enough to make me interested in reading it (note: the US title is Wolf on a String) – Prague is a beautiful city and one I would recommend visiting, if you haven’t already. To experience Prague as it is in this novel, however, you would need a time machine as the action takes place more than four hundred years ago, at the end of the sixteenth century. It’s 1599 and Christian Stern, a young doctor from Regensburg, has just arrived in Prague. On his first night in the city he stumbles across the dead body of a young woman half buried in snow. He reports his discovery and expects that to be the end of the matter, so he is shocked when he is accused of killing the girl himself. Her identity is given as Magdalena Kroll, mistress of the Holy Roman Emperor Rudolf II and daughter of his ‘chief wizard’ Ulrich Kroll. Stern knows he is in serious trouble, but fortunately for him, the emperor – a superstitious man with a strong belief in the occult – believes him to be a messenger whose arrival in Prague had been predicted in a prophecy. Freed of suspicion now, Stern is given the task of discovering who really did kill Magdalena Kroll. It is a mission which will bring him into conflict with some of the most powerful men in Prague, embroil him in a love affair with another of the emperor’s mistresses, Caterina Sardo, and send him to the town of Most in search of the English occultist Edward Kelley, who it is believed may hold the key to the mystery. Prague Nights is one of those books that sounds as though it should be much better than it actually is. That’s not to say that I didn’t like it at all, because there were some aspects that I enjoyed, which I’ll return to shortly, but it definitely wasn’t the atmospheric, exciting historical mystery novel I had hoped it would be. I was disappointed that it wasn’t really much of a mystery; yes, there is a murder at the beginning and we find out who was responsible for it at the end, but in between, our narrator, Christian Stern, makes very little effort to actually investigate. Things happen around him but he takes no active part and by the time I reached the end of the book, I found that I no longer really cared how Magdalena Kroll had died and why. I had often tried to imagine Prague and its glories, but the reality of it was grander and more gracious than anything I could have dreamed of. Past the castle, we stopped on the height there to look out over the city. The sky was white and the air was draped with a freezing mist, pierced by many spires, all of them appearing black in that pervasive icy miasma. Despite the wintry murk, I could see the river and its bridges and, beyond, the clock tower in the Old Town Square. This wasn’t enough to make me love the book, however. To be able to love a book I need to at least feel something for the characters and unfortunately I felt very little for Christian Stern or any of the other people who play a part in the novel. That’s particularly frustrating because, in real life, Rudolf II and the members of his court sound fascinating, especially his son, Don Julius Caesar. In his author’s note, Benjamin Black talks about the historical figures on which his characters are based, explaining where he sticks to factual information and where he uses his imagination. As I previously knew nothing about 16th century Prague or Rudolf’s court, it was good to have the opportunity to learn something new, even if the story itself didn’t really succeed in holding my attention. Have you read anything by Benjamin Black/John Banville? 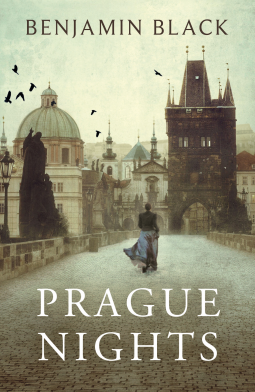 And do you have any other books set in Prague to recommend? I’v read one novel by John Banville, The Blue Guitar, which I loved. And one crime novel by Benjamin Black, which I didn’t! I think his style is better suited to ‘literary’ writing, though I believe his Benjamin Black books are very popular. I don’t think I would want to read any more Benjamin Black books, but maybe I should try The Blue Guitar. I can see how his writing style might work better with a different type of book. I have not read either John Banville or Benjamin Black books! The premises of this book sounded really good, and I do feel disappointed that it failed to live upto the expectation! I do increasingly feel that many books, have an really interesting historical setting, but the actual plot leaves much to be desired. It seems like the historical background should carry the day, but the genre is called historical fiction and fiction is equally important in this equation as history! Yes, it was disappointing because it could have been such a good book. The setting and time period were fascinating, but the characters and plot definitely didn’t live up to expectations. I agree that some books just don’t get the balance right between history and fiction! I’ve read one book by John Banville, The Sea, which I enjoyed – but it was years ago and I don’t remember much about it. I’ve read Vengeance by Benjamin Black, number five in Black’s Quirke Mysteries series. I thought it was more of a character study than a murder mystery and the mystery was not complex or difficult to solve. I liked it and noted I wanted to read more in the series – but haven’t! I liked his style of writing – clear and concise, with a good sense of time and place. I’m sorry Prague Nights didn’t hold your interest but at least it gave you some insight into Prague’s history. I did like his writing style and the sense of time and place he creates, but I still felt there was something missing from this book. Maybe I would have preferred one of the Quirke mysteries – it sounds as though the characterisation is stronger in those. At least, as you say, I’ve gained some insight into the history of Prague and Rudolf II’s court. I attempted to read Banville’s The Sea, but I gave up because I found it a bit boring. Sadly, your review of this book doesn’t exactly entice me to give Benjamin Black a try. Sorry you didn’t enjoy The Sea – it has never sounded very appealing to me either. I think Banville/Black is probably just not my type of author. I have always meant to read Banville but haven’t yet. I get the idea he is very literary and very sad. I read the first Black, Christine Falls, and it was ok but Tana French has it all over Banville as an Irish mystery writer. These are my humble opinions. I wasn’t very impressed with this book as a mystery, but I did like the writing – maybe his style is better suited to the Banville books than the Black ones. I’ve read several by Banville and a couple by Black and I agree with Fiction Fan above. I’m very fond of Banville but Black is … well … he gets a little literary for what I really want in a crime novel or thriller – all the lovely words slow the pace down. I’m interested in Prague Nights / Wolf on a String – though. I enjoy that setting from several other books – The Prague Cemetery (Umberto Eco), HHhH (Laurent Binet), Kavalier and Clay (Michael Chabon) so I might try it. Banville’s books have never really appealed to me, but maybe I should try one just to see what I think. I’m not sure whether I’ve read any other books set in Prague – I’ll have to look out for the three you’ve mentioned. I read The Sea by Banville, which a lit professor I know considers a perfect book, but I was not so enamored of it. I’ve never been very interested in reading The Sea – it just doesn’t sound like my kind of book. It was well written, but a little dull. I really loved The Sea but haven’t read any other Banville. I might have to try this one! I hope you enjoy it if you do try it! It would be interesting for you to be able to compare his books written under the Black name with the Banville ones. I haven’t read anything by John Banville, but I have read all of books in the Benjamin Black “Quirke” series, plus Prague Nights (your review of which I thought absolutely nailed it). I loved Christine Falls, the first book in the Quirke series, but I think there has been a gradual falling off in quality as the series goes on — maybe he’s churning them out too fast? For a completely different novel set in Prague, I recommend A Stricken Field, by Martha Gellhorn, published in 1940 and based on Gellhorn’s experiences as a journalist in Prague in 1939. There was recently a nice appreciation of the book in The New York Times, see https://www.nytimes.com/2017/05/25/books/review/the-stricken-field-martha-gellhorn.html?_r=0. Thanks for commenting. I wasn’t planning to read anything else by Benjamin Black as this book failed to impress me, but maybe I should at least try Christine Falls. I haven’t heard of the Martha Gellhorn book, but it certainly sounds like something I might be interested in reading. I meant to add, I read somewhere recently that Banville has written (under his own name) a kind of sequel to A Portrait of A Lady, titled Mrs. Osmond, which is to be published in October. I’m looking forward to reading that, although I should probably re-read A Portrait of A Lady first. Interesting – I’ll have to look for that. I really enjoy both James’s book and Banville’s writing. That does sound interesting, but I have to confess that I haven’t read A Portrait of a Lady yet, so I will have to read that first!